Last week's quiz went over pretty well, if my tracking numbers are to be believed. And it was a tough one, too: you had 90 seconds to identify the killers of 30 DARK SHADOWS characters, a time frame that didn't leave a margin for indecision. If anyone scored 100 percent on the quiz, they weren't bragging about it here in the comments section. This week's quiz is ... easier. Maybe? I've left 90 seconds on the clock, but this time you've got only 12 dead people to identify. 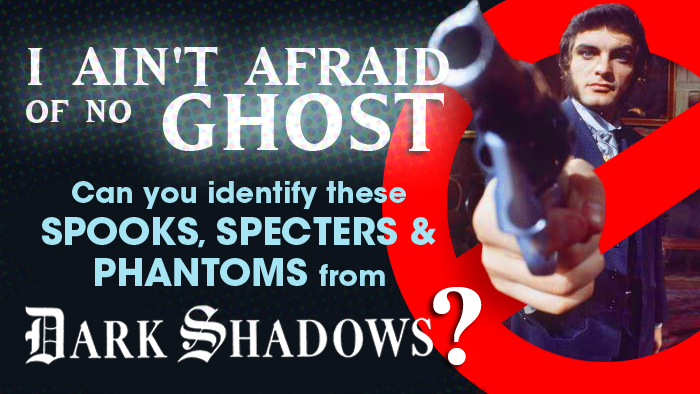 I've arranged 12 ghosts from DARK SHADOWS in a line up ... you just have to click on their photo to ID them! Unfortunately, the game host doesn't allow for image-based quizzes to be embedded on this website, so you'll have to visit Sporcle to play the game. You can find it HERE! And don't forget to come back and let me know how it works.